Our new website has launched and provides you with more functional journey planning features as well as a cleaner, more easy-to-use website experience. You can now plan your journey between two locations, check your bus's distance in just a couple of taps, and find the latest fares and information displayed quickly and concisely. 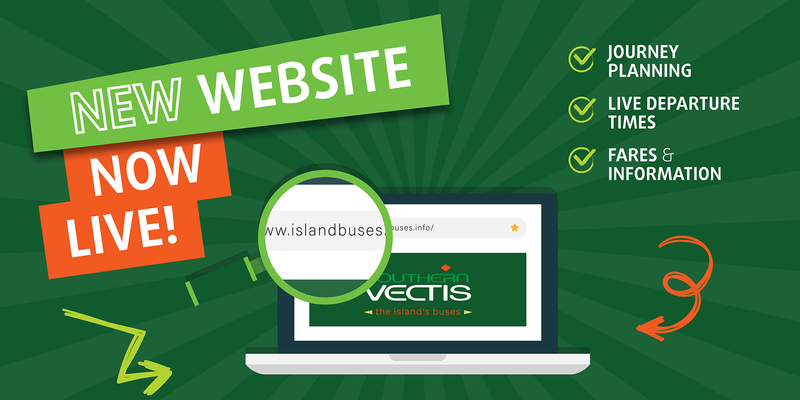 The website was developed by digital agency Passenger, based near to our head office in Poole. We are proud to be partnering and working closely with this agency to provide improvements and new features as time goes on. How do I access live departure times? On the route timetable pages - if you're looking at your individual route timetable, you can simply click on your stop name and the departure times will pop up for that stop. Don't forget to select the exact day you need timetables for from the calendar and click "Update"
This should make live times much easier to find and use than the old website, although we appreciate new things take some time to get used to. Your old favourite stops won't be carried over so don't forget to favourite your local stop by using the star symbol. Have you tried our new journey planner? Our new journey planner/directions is a great feature that shows you the best way to get from A to B using Southern Vectis. Simply type in your starting point (or let us find your current location), tell us where you're going and when. We'll then do the rest and show you the best ways and routes to get there. We also display walking times so you know exactly how long the journey will take. All of our journey planning features, including timetables and maps, live under the one heading of 'Plan your Journey' so you know where to find everything. You can favourite stops, routes and journeys for easy access. We currently have a focus group testing the platform and feeding back any issues, likes and dislikes to us. If you have any burning comments that you'd like to tell us, you can do so using the little feedback widget displayed on the bottom right of each page. By doing this, we can see exactly what page you're on at the time which helps build a better picture of your experience. Alternatively, if you have any specific comments or feedback, then get in touch with us and let us know.